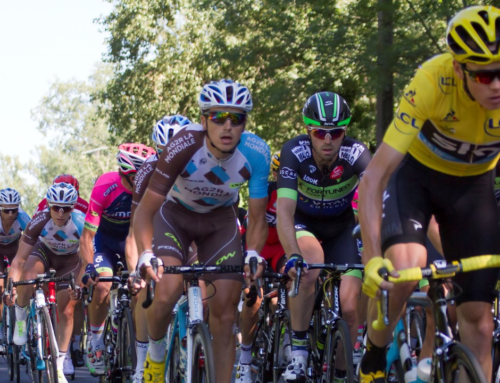 In our earlier blogs, we explored a brand new way of looking at power data. The concept of a fitness signature was introduced, which is a set of three fitness values that apply to individuals and the activities they perform. We also introduced Maximal Power Available (MPA) Analysis which is a way to examine power data to extract meaningful information about the fitness of an athlete. MPA is based on your fitness signature. We then described various applications of MPA from workout design, measuring work and measuring other key derived measures from activities such as strain, focus and specificity used in tracking overall training. As a closed-loop process, i.e. one with feedback, the determination of a valid fitness signature comes from your maximal efforts. With a valid fitness signature, we can then predict your MPA at any time during exercise. In addition to determining MPA, time-to-exhaustion for any given power can be determined. Similarly, using MPA we can determine maximal duration of any steady-state effort. This is because MPA and your fitness signature determine your power-duration capabilities at any given point in time. Thus, MPA provides a convenient way to establish the limits of athletic performance for any duration, at any intensity, at any time. Since MPA recovers when power drops below Threshold Power (TP), we can also determine time-to-recovery. Time-to-recovery can similarly be based on complete recovery, or recovery back to a particular MPA. Recovery back to a particular MPA is a very powerful technique in the definition of workouts. The recovery timing can also factor in the intensity at which the recovery occurs. 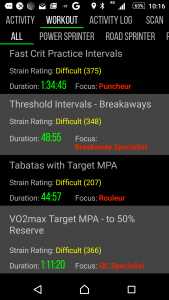 Using MPA as fatigue targets and recovery targets using varying intensities is a key part of advanced workout design. Xert Mobile is a smart phone app that displays real-time, in-process information during your activity. 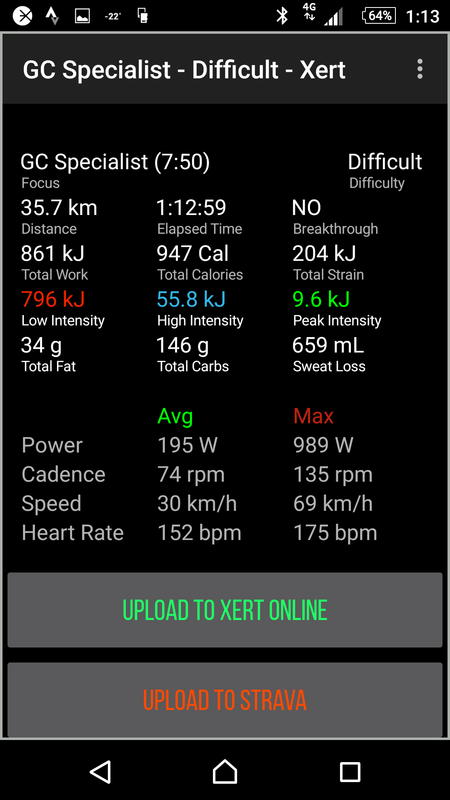 Xert Mobile acts as an advanced cycling/activity recording computer for power, torque, cadence, speed, distance, heart rate, GPS and altitude data. Gold: Above MPA. Breakthrough region. The Xert-o-meter also shows workout targets for convenience as well as the remaining interval duration when workouts are being played. 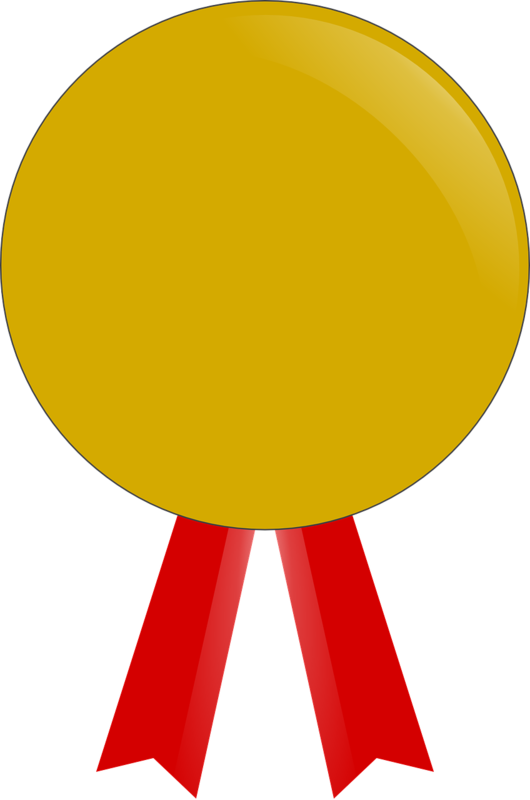 A medal – – will also appear when you have achieved a fitness breakthrough. Below the Xert-o-meter, you have all your selected metrics. Taping a metric, reveals additional configuration options when applicable. 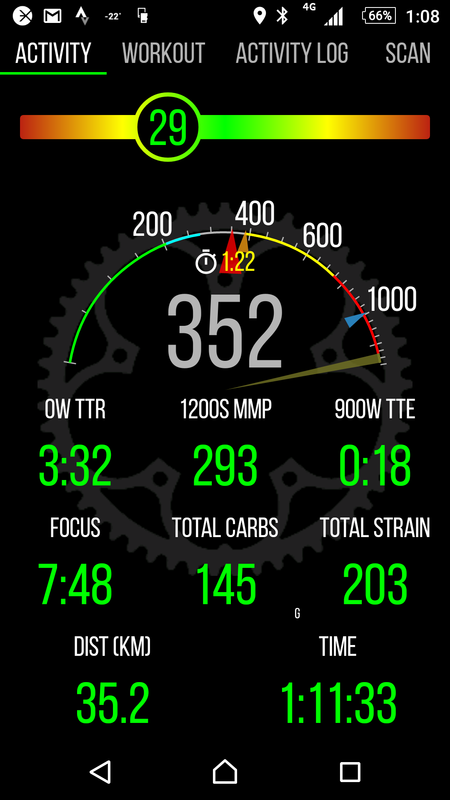 Tap-and-hold a metric, reveals a selection screen enabling you to choose which metric to display on the screen. 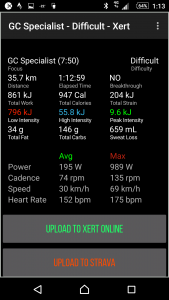 Xert’s Workout Player provides unique and highly-individualized workout selection and execution characteristics. 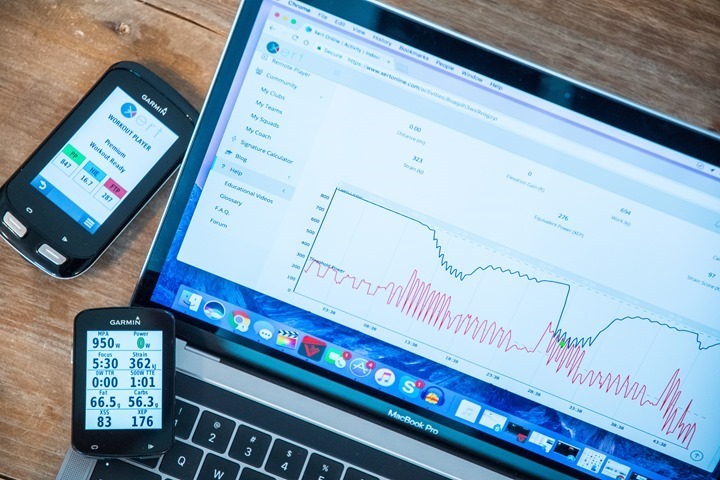 When selecting a workout, Xert Mobile obtains all standard workouts, as well as any custom workouts you may have created, downloads them, runs MPA calculations against all of them using your current fitness signature. It also determines the workout dynamic duration, focus athlete type and strain for each workout based on your current fitness signature. Using your finger, you can scroll through the library to choose from the available workouts. 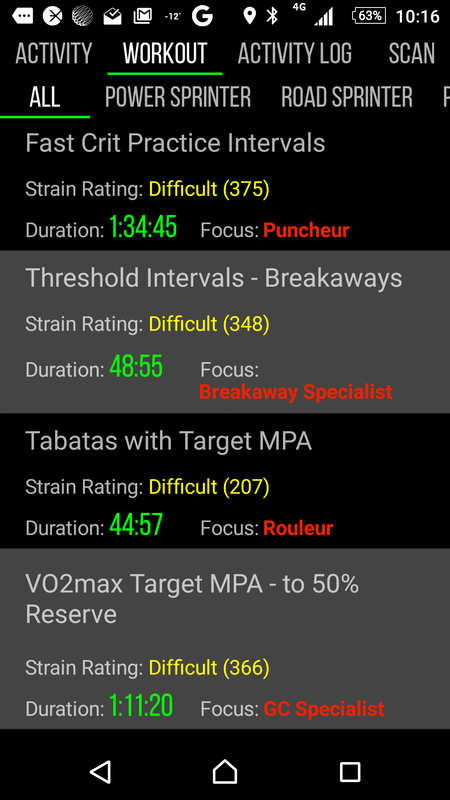 If you are looking to have a specific focus, tapping on the corresponding athlete type tab will show all the workouts that have been dynamically calculated to be in the athlete type category based on your current fitness signature. For example, on the left we have a workout listing where we have several workouts. 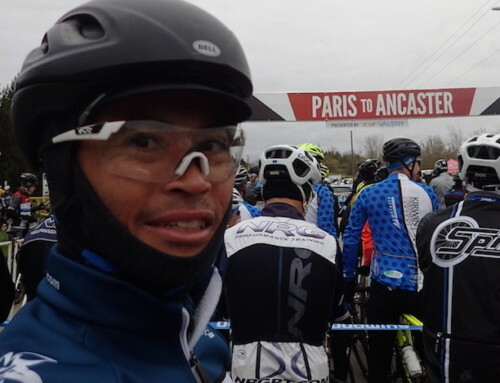 If my focus was on becoming a Breakaway Specialist, I could consider the Threshold Intervals – Breakaways workout. 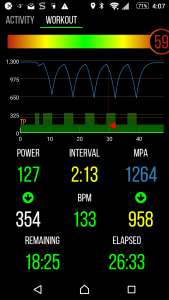 One can see that based upon my current fitness signature, the strain rating is 348kJ which categorized as Difficult. If my motivation was high, I could consider this difficult workout, noting that it generates a considerable strain in only 48:55. However if my motivation was low on a given day, I may opt to select a workout with less difficulty. 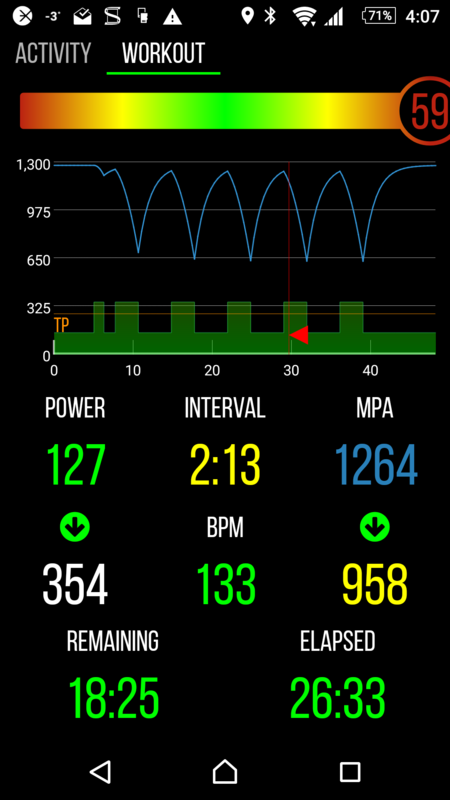 Xert Mobile enables you to perform the unique, MPA-based workouts that can be defined with Xert’s Workout Designer. MPA-based workouts are different than regular workouts in that they target specific fatigue and recovery, rather than using simple durations at fixed power. For example, during execution of a workout, when an interval is based on a target MPA, the duration of the interval is recalculated every second based on the target power. If you hold the target power, the duration of the interval counts down every second just as a normal timer would. If your power is above the target, the timer speeds up. If your power is below the target power, the timer slows down. If you stop or go below your threshold, the timer reverses and increases time. 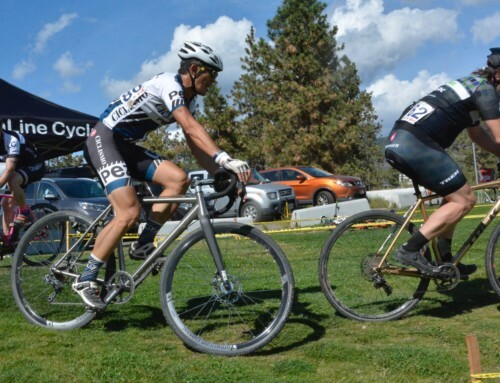 Xert’s workouts ensure you that you are reach your fatigue and recovery targets before the interval is complete. In cases where your motivation is not there for the difficulty of the workout, you can simply skip the interval and keep going. Conveniently, Xert Mobile will beep when your target is reached. 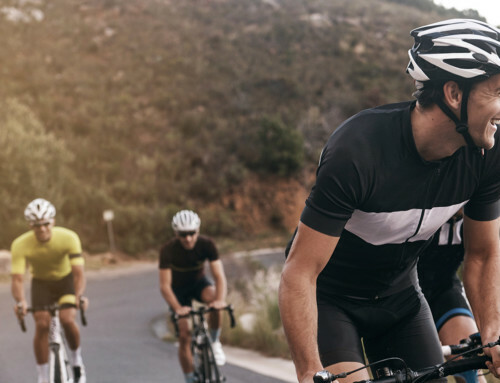 This makes execution of workouts something that can be done outdoors our when playing online cycling games like Zwift. By ramping up intensity until the beep sounds and then resting until the next beep, Xert Mobile’s workouts can be performed in unstructured settings while still enabling you to meet your workout goals. At the end of each activity, Xert Mobile summarizes all the collected information about the activity. The summary information was determined based on the specific work and power output of the activity using your current fitness signature. In other words, it is a highly-individualized determination of the focus, strain, fat/carb consumption, etc. for the current activity based on your fitness.